KUWAIT: Gulf Bank announces that it has received the Payment Card Industry (PCI)-Data Security Standards (DSS) 3.1 level one certification for the second consecutive year. PCI-DSS is the global industry standard for compliance and security for personal payment card data, to which vendors and businesses must conform to in order to protect cardholders’ personal data and prevention from credit card fraud. SISA the leading payment security specialist and information security firm presented the certification to members of the Gulf Bank team recently. Commenting on this accomplishment César González-Bueno, Gulf Bank CEO, said: “Gaining PCI-DSS certification underlines our commitment to internationally recognized security standards. These standards are some of the most stringent in the world, they are designed to provide enhanced protection of customers’ card information. Gulf Bank is committed to offering its customers the best services possible combined with the utmost in safety and security”. 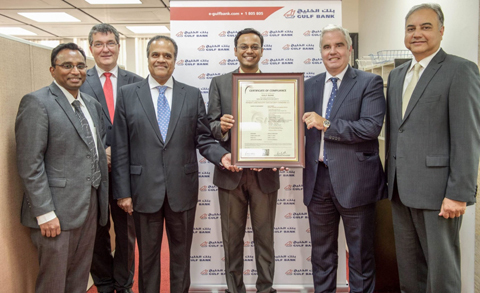 Gulf Bank met six separate security pillars to achieve the PCI-DSS 3.1 compliance. The pillars are: building and maintaining a secure network, protecting cardholder data, maintaining a vulnerability management program, implementing strong access control measures, regularly monitoring and testing of networks and maintaining an information security policy.